Surveying a stretch of the stressed Jones Falls directly below Interstate 83 and Falls Road last month, state officials found, among other creatures, four brown trout. “Their presence proves that though our waterways are facing significant challenges, there is still a lot worth fighting for and it’s not too late to restore our streams,” said a release from Blue Water Baltimore, which participated in the Department of Natural Resources stream survey along with Maryland Trout Unlimited. 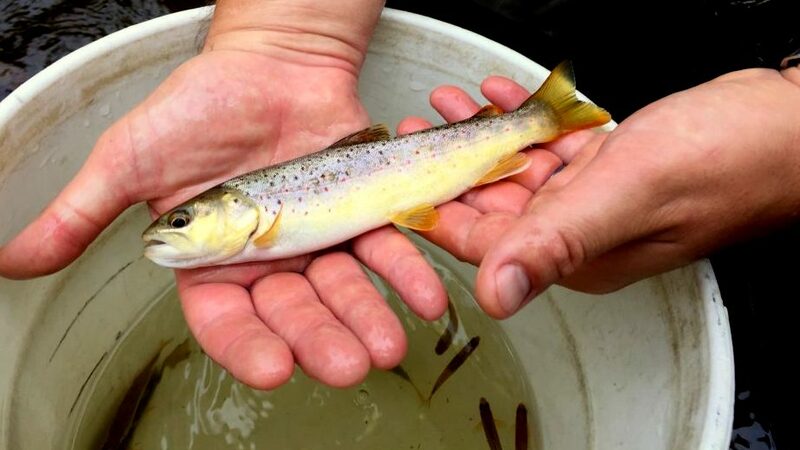 Best of luck, though, to these Salmo trutta and all their aquatic colleagues should they travel downstream to where Baltimore discharged millions of gallons of raw sewage this summer, including another release last Thursday. According to the Department of Public Works (DPW), the city dumped 141,000 gallons into the Jones Falls through an underground “structured release” outfall at North Charles and West Lanvale streets on September 14. Although these outfalls were built into the city’s system years ago to serve as relief valves and have been the source of multi-million-gallon discharges (and a federal lawsuit) during times of heavy rain, this recent release was not weather-related. The two-hour discharge, it appears, was the result of the city’s error. “The overflow occurred when a contractor performed line cleaning downstream, causing this sewer line to back up and exceed capacity,” according to the DPW release. The Jones Falls isn’t the only local waterway getting socked with sewage. A release of more than 10,000 gallons into the Gwynns Falls was identified on Tuesday, according to DPW. Routine stream sampling turned up an underground release of sewage that was traced to a broken pipe in the 2500 block of West Lexington Street. DPW engineers “determined that the 12-inch clay sewer pipe built in 1928 is now leaking in four segments,” according to a city news release. “None of the sewer overflow has reached the street. The overflow is leaking into a drain that discharges into the Gwynns Falls,” DPW said. The agency plans to reline about nearly 940 feet of broken sewer pipe to correct the problem.